Home » Pages from a Disney Book » Top 10 Questions For a Walt Disney World Trip: My Answers! Over the past 20 years, I’ve heard nearly every question one might have to ask about going to Walt Disney World. I often get e-mails from readers, or just get stopped in the hallway at my son’s school. From the podcast to the message boards, I hear it all. Several of these questions come up time and time again, and seem to be common, especially among Disney vacationers who don’t visit frequently. Perhaps they will help you, or someone you know! 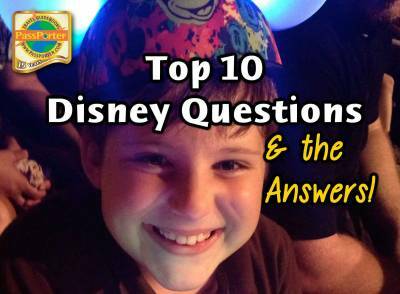 Here are the top ten questions I hear about Walt Disney World … and my answers! The best time of year to go is when you’re ABLE to go! That said, any school breaks or vacations are the busiest times of the year, and correspondingly more expensive. So then you have to balance taking the kids out of school and saving some money (and time) vs only going when school isn’t in session. I’ve done both, though I’m careful to only take my son out of school when I think it won’t be too disruptive. The most crowded times are holidays — I avoid the Christmas/New Year times at all costs. Least crowded times are early in the year (January/February), September, and November (though not Thanksgiving). I think the best weather at Walt Disney World is March-May, when the flowers are in full bloom and the glorious sun is shining down without scorching you! Generally speaking, the farther ahead you book, the more money you can save because you have your pick of the lowest-priced options. That said, I myself rarely book more than a few months ahead simply because I’m really busy, but aren’t we all? As a work-at-home mom, I find I often don’t know if we’ll have the free time to go on a Disney vacation until I can really see that particular spring break or summer vacation fast approaching. If you can book at least three months ahead of time, you’re doing good! Should I fly or drive? Look at the cost of airfare versus the time it takes to drive, in addition to gas, food and other normal parts of any road trip. For some, time is money, and if that is the case, I generally recommend flying. On the other hand, if you enjoy a road trip and isn’t MORE money than a plane, go for it. I fly and drive — mostly fly — and enjoy both methods of transportation. About how much can I expect to spend per night if I want to stay at Disney on property? One night in a value resort on Walt Disney World property starts at $101/night, and that’s on weekdays in the off-season (Aug 3-Sep 12, 2014). If you go during prime spring break or summer vacation season, expect to pay a minimum of $150/night. Of course, these are “rack rates” and you can find some better deals when Disney releases a special offer, which are generally advertised liberally on their web site at disneyworld.com and around the web. For example, right now there’s a deal for up to 30% off when you stay up to 5 nights, or up to 35% off for six nights or more, and it’s good for June 15-August 28. Always check with Disney and ask about discounts! Are the “value” options nice enough or should I consider splurging for something nicer? I personally enjoy staying at the value resorts, especially Disney’s Pop Century Resort and Disney’s Art of Animation Resort (their two newest value resorts). When I’m on a tight budget, I always go for the value resort and I put my focus on my park time — my hotel room is mostly a convenient place to sleep! I do definitely prefer to stay on Disney property — it just makes it so much easier to get around, and I really prefer staying within the Disney “bubble.” When I want to splurge, I move up to a moderate (such as Port Orleans French Quarter) and occasionally a deluxe (we recently enjoyed a great visit to Disney’s Wilderness Lodge Resort). I think if you’ve got the money to afford on a fancy hotel, go for it — otherwise, save it for food and souvenirs. Isn’t it cheaper to stay outside the park? I’ve done this, and generally, it’s cheaper. But … I really dislike it. Staying at a cheap hotel off-property is easy on the wallet, but it’s totally lacking the convenient and “magic” of staying on property. You have to pass by all the chain restaurants and tacky tourist stands on your way to and from the park. And forget relying on the park shuttles from those hotels — they are usually the pits! The only exception to this rule, in my opinion, is when I rent a vacation home off-property. If I want a luxuriously large vacation home I have no choice but to go off property and the luxury seems to balances out the tackiness. A lot of parents I talk to are staying in timeshares with their families, and if you fall into that category, go and have fun, save some money, and put your focus on your park time. Do avoid doing a “timeshare deal” with an unknown outfit down there, however — that almost always ends in frustration and it’s just not representative of the real magic of a Disney vacation! If we’re staying at the resort, should we bring our car, or use Disney transportation? There are differing opinions on whether you need a car or not, but generally I prefer to use Disney’s transportation. I like not worrying about driving or parking a car when I’m on vacation, and I find Disney’s transportation options more than adequate. Sometimes it makes sense to rent a car, like if you plan to make a sidetrip to LEGOLAND Florida. But the rental fees and gas can add up quickly, too. Remember, too, that if you’re staying on Disney property you get to use Disney’s Magical Express — the shuttle to and from the Orlando Airport — at no additional charge. Besides, I think Disney’s buses, monorails, and boats are a bit part of the magical Disney experience — in fact, I got the idea for the PassPorter guidebooks while riding on a Disney bus nearly 20 years ago! Is that Disney Dining Plan worth it? For me and my family, we don’t really get enough out of the Disney Dining Plan to make it worth the money. I typically only use it when a free Dining Plan is offered for a package. Our family eats less food, and at a wider variety of places, than what really works best for the Dining Plan. But that is OUR experience, and there are some families who absolutely love the Disney Dining Plans! Ask yourself if your family are big eaters who enjoy sit-down meals and aren’t worried about planning them in advance with reservations. If the answer is yes, then a Disney Dining Plan might work well for you. If you’re not into a lot of sit-down meals, there’s a Quick Service dining plan as well. To truly save money, however, I’d skip the dining plan, bring along breakfast foods for the mornings before the parks, and choose eateries carefully (in-park eateries tend to be a bit higher than resort eateries). If you’re in doubt, do the math by pricing out foods you think you might eat at meals and comparing that to how much a Disney Dining Plan would cost you per day! Do I really have to make dining reservations at Disney? No one is twisting your arm and you won’t starve if you don’t have reservations. That said, if you have your heart set on a particular restaurant, or really want to eat at some special places, you’ll want to make those advance dining reservations! The popular spots book up fast, especially during peak times. I do a mix — I reserve a few places I really want to eat at, and otherwise I wing it or have counter service for the remaining trip. I heard I can make reservations for rides, too — is that true? Yes, all guests can use Disney’s FastPass+, a reservation system for rides, shows, and attractions at Walt Disney World. By selecting an attraction, and a one-hour time window in which you’d like to experience the attraction, you make an appointment for the attraction. The number of people who can make such a choice in any given hour is limited, which means that FastPass+ queues for any attraction are virtually guaranteed to never be longer 20 minutes. If you’re staying on property, you can make these reservations in advance at http://www.disneyworld.com (click on My Disney Experience). If you’re staying off-property, you can visit a FastPass+ kiosk upon your arrival at a park to make reservations. FastPass+ is free! I agree with you on a lot of these, especially staying within the Disney “bubble”. As a matter of fact, we have never stayed out of the “bubble”, I’m afraid to try it!!! My recommendation? NEVER try it! We decided to stay off property for a few of our Disney trips, and experiences have ranged from disappointing to true disaster! We learned our lesson and will never stay off property again, unless we have a scenario like the one mentioned here with a vacation property. And the thing is, you really DON’T save money. If you want to stay in a truly scary place where the clientele, the rooms, and the staff are really frightening and you don’t feel safe or clean, yeah you might save a couple of bucks. But most people at least want a place where they feel safe and the rooms aren’t disgusting, and that will cost you $100+ per night. Once you’re paying that already, you might as well be staying at an on-property value resort. ← PassPorter Wants You: How to Get Published, Seen, and Heard at PassPorter!